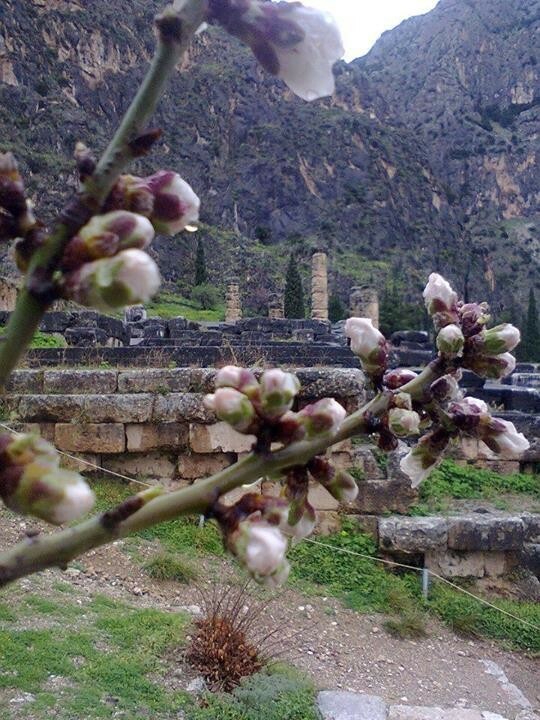 A travel through the time, it’s in a part of the Greek land that rivets you. 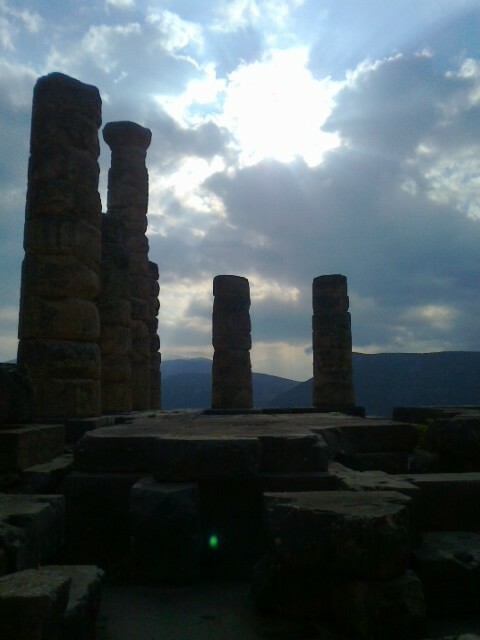 The majesty of the archaeological site of the Oracle of Delphi is insurmountable: ruins of ancient buildings that reach to the limits of the myth, the great mystic process of prophecy that took place here, the sanctity and respect that the ancients faced the Oracle, and unique Delphic Landscape, complete a picture that is classified at “life experiences”. The archaeological site extends across all the slope of the hill and is strewn with artefacts, almost in every step of the visitor, which will take time to climb. 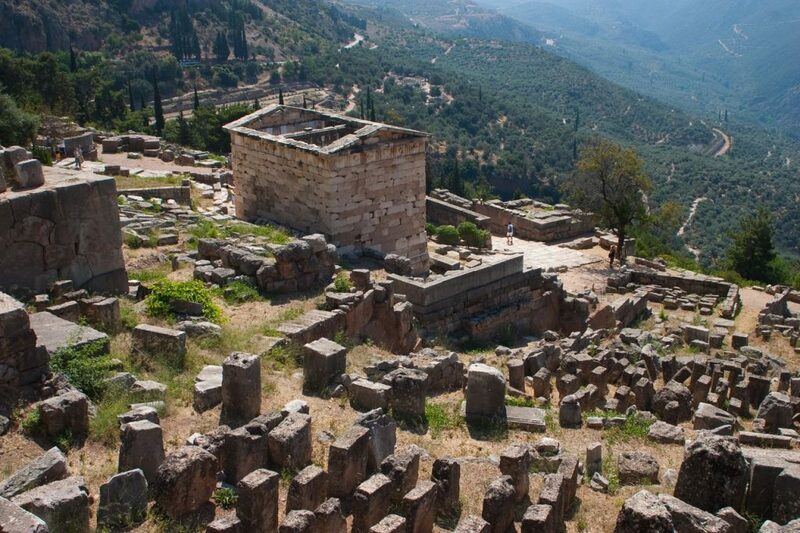 What impressing already from far away is the ancient vertical cliffs that “define” the Delphic Landscape: these Phaedriades Stones, who have their own place in the history of Oracle, and thence precipitated the profane. 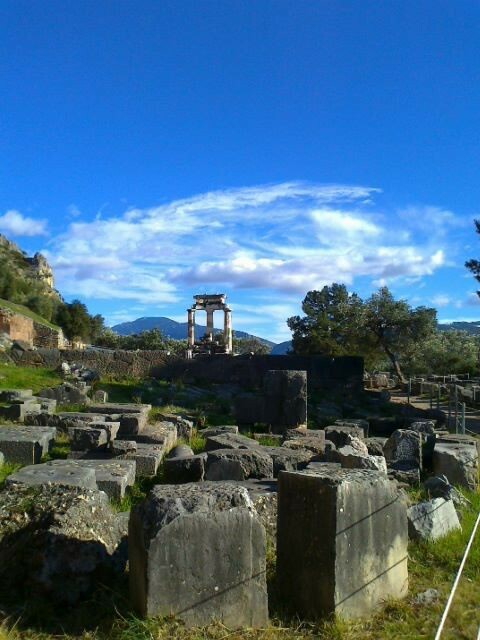 As we come from Athens, we meet firstly the temple of Athena Pronaia, from which survived largely the famous dome. 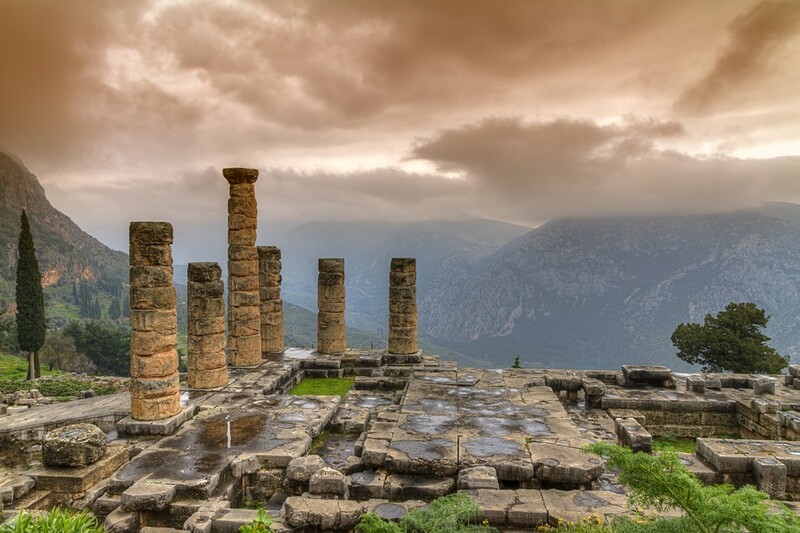 At this point, it is probabale the position and the space that occupied, while parts that survived can be admired in the Archaeological Museum of Delphi. 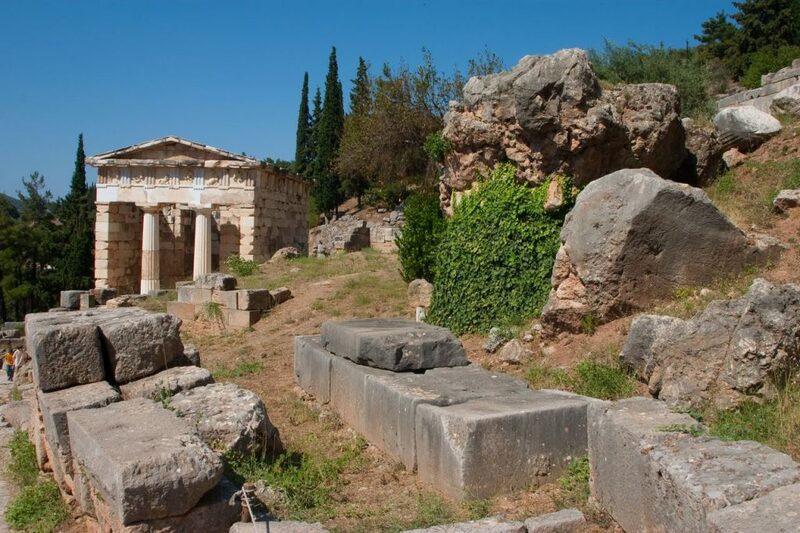 The ruins of three temples of Athena are distinguished and the altars that had been in the temple. With northwest destiny we can meet the gymnasium. Safety training had a palestra and baths and it is considered the most complete of the antiquity. It’s estimated that it was created the 4th century B.C. and it was used until Roman times. 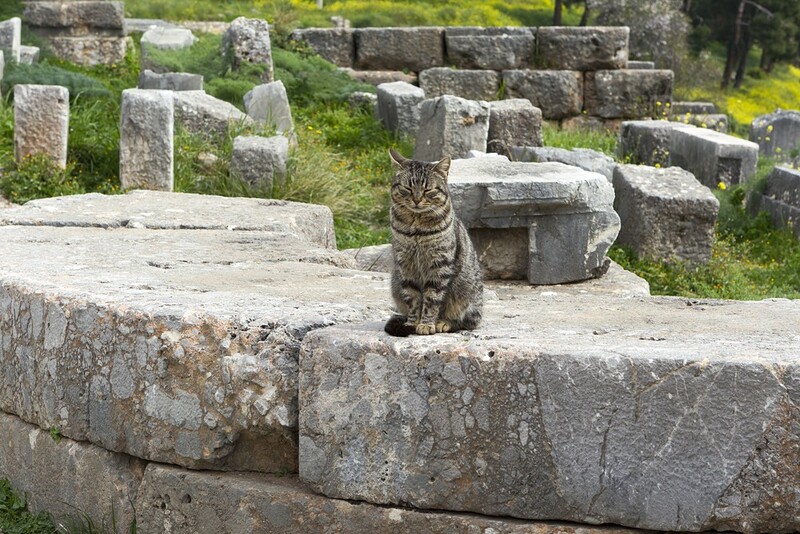 Continuing towards the sanctuary of Apollo, we found near the modern road the Archaic Krini of Castalia Pigi. 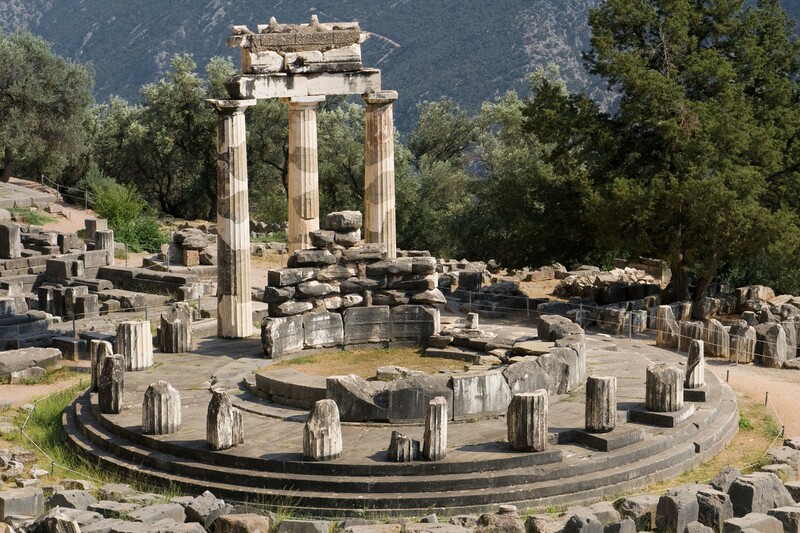 It was the sacred source of the oracle, where took place the purification of Pythia and the priests of Apollo. Theopropes had to wash up to waters, those who came to the Oracle to ask a prophecy. 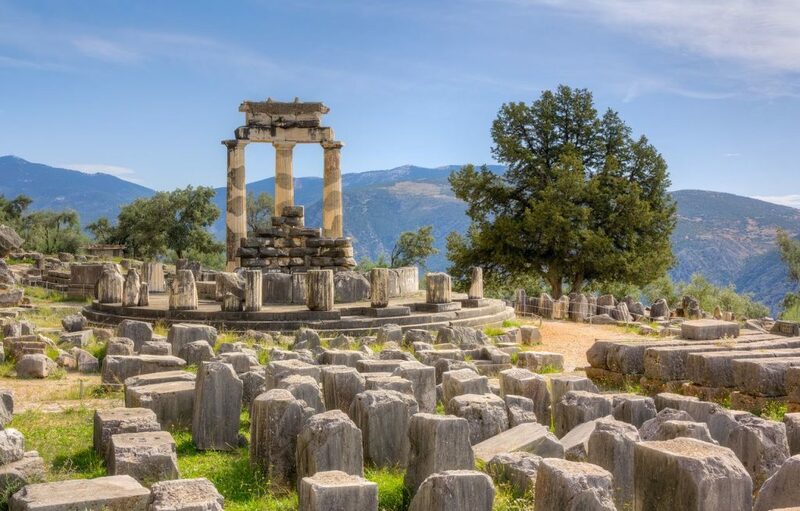 Krini who was described by Pausanias, the “Fokika” from which we have now more fully description of the region in ancient times, it’s an oeuvre of the first century BC and the newest fountain of Castalia survived significantly. 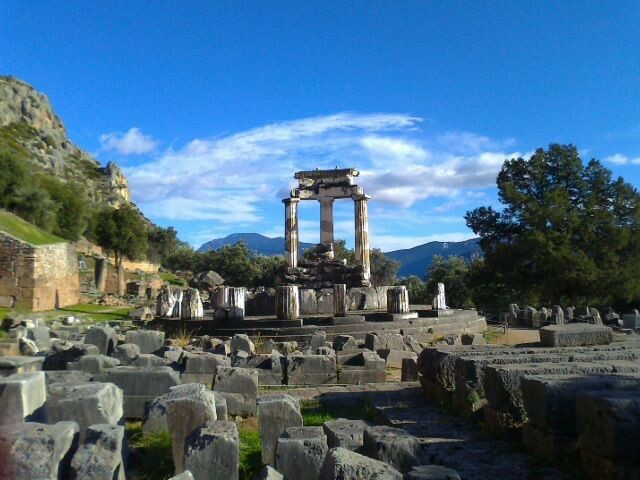 In the Delphic Landscape dominates the temple of Apollo. The area was enclosed by an enclosure and the gate was located in the southwestern part. 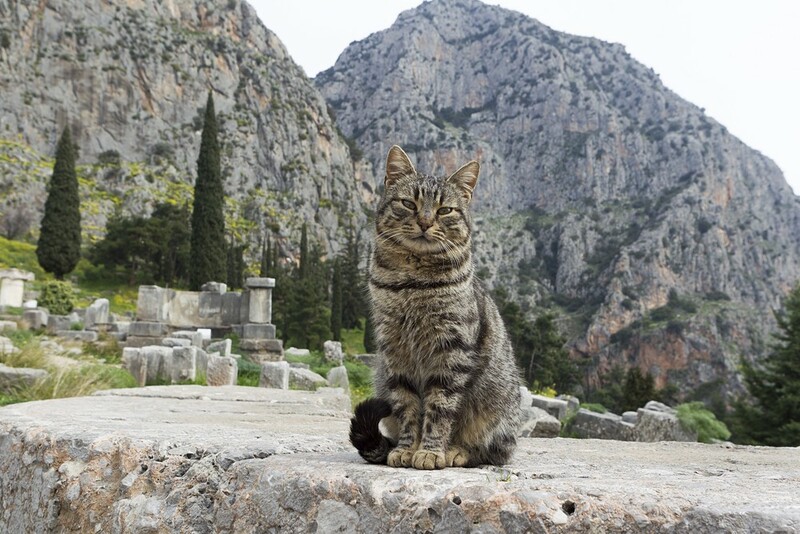 Today, we follow for the ascent ancient the Sacred Way, the same way that they followed in ancient times the theopropes, those who came here to ask an oracle. 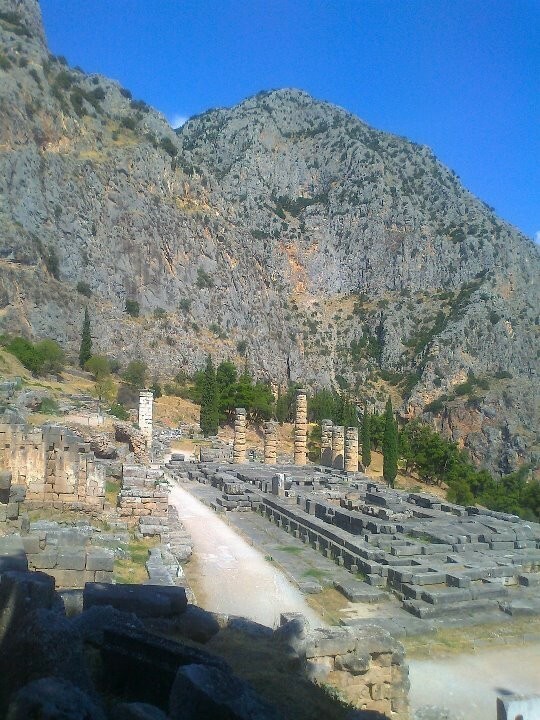 Along the ascent to the temple of Apollo, the most important building of the Oracle, since here culminate the worship of God, we find numerous foundations and ruins of Cities Treasures: they are the chapels which each city built to house its offerings to the oracle, in gratitude for the fulfillment of prophecy. Each such temple of course, reflects the power and richness of the city which made it. The Siphnian Treasure, among the first that we meet during our ascent, was known in antiquity for its artistic value. It’s estimated to have been built in the development of the island after 550 BC: the exploitation of gold and silver mines had great profits. For the construction of the Treasure, they had been transferred marbles of Paros and instead of columns on the façade, they used female statues. During our tour today at the archaeological site, we will see the foundations of the Treasure and an ankle decorating the base. 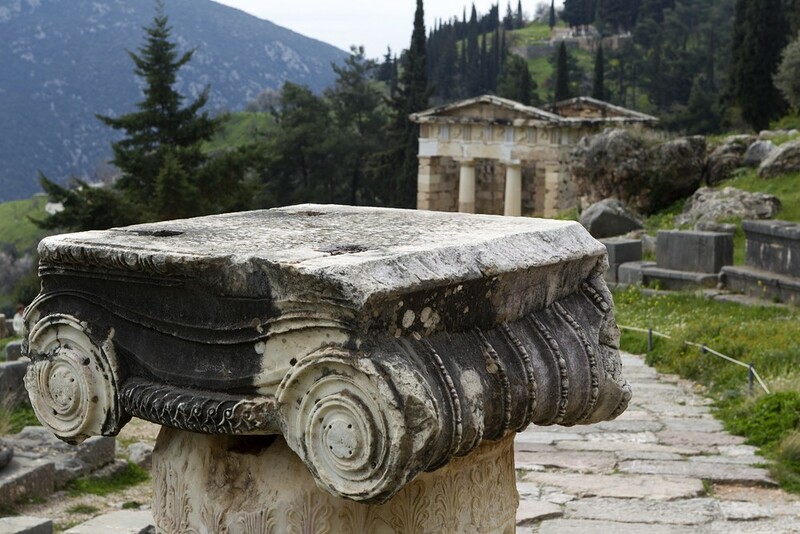 The sculptural decoration of the building that has been survived, it is exposed in the Archaeological Museum of Delphi. 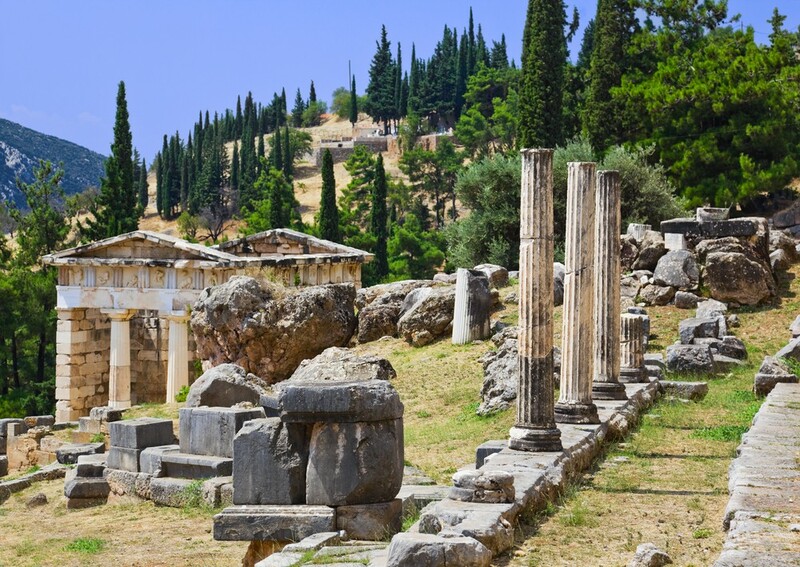 Continuing the climb to the Sanctuary of Apollo, we find the best preserved building of the Oracle: it is the Treasure of the Athenians. Located just after the first turn of Iera Odos , across from the Treasure of Knidians and Syracusans, near the Parliament House . 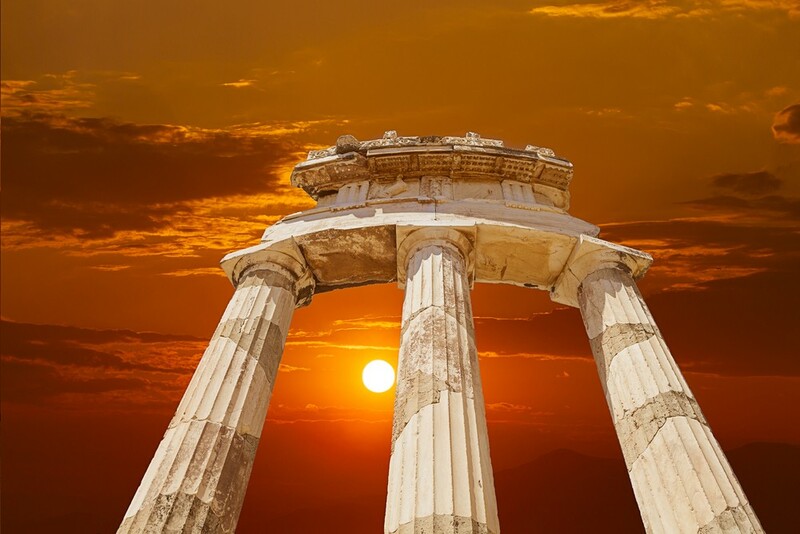 Probably built in the early 5th century BC and it is considered to express the victory of democracy in Athens. 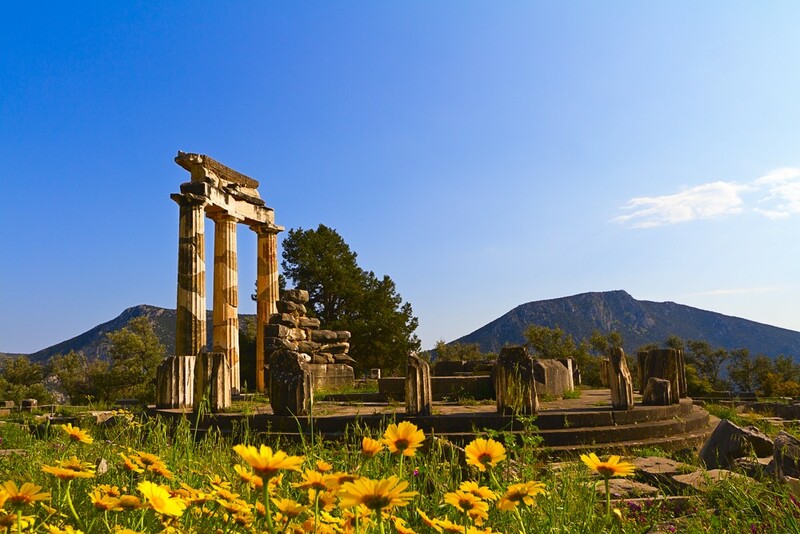 The second theory says that the treasure was built in 490 BC, immediately after the great Athenian victory over the Persians at Marathon. Parian marble was used for the construction and the labors of Hercules and Theseus adorned its metopes. 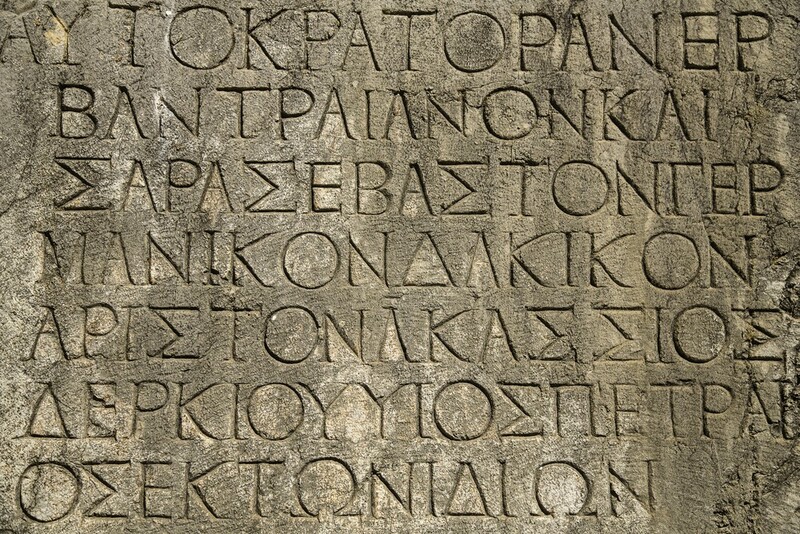 A lot of inscriptions had rescued from the walls of the Treasure, including the two famous musicians hymns exhibited in the Archaeological Museum of Delphi, like most of the moving parts of the monument found. 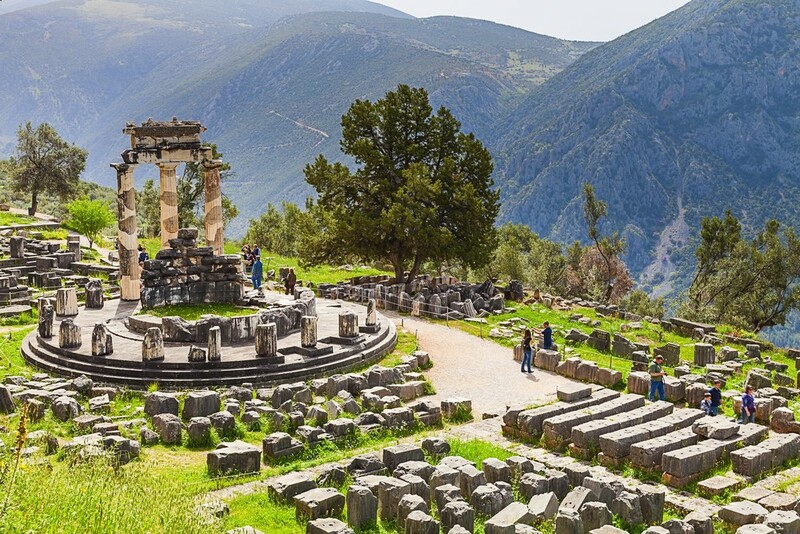 The Treasure of the Athenians is the only building of Delphi that had saved enough of the ancient material and thus it has fully restored in 1906. 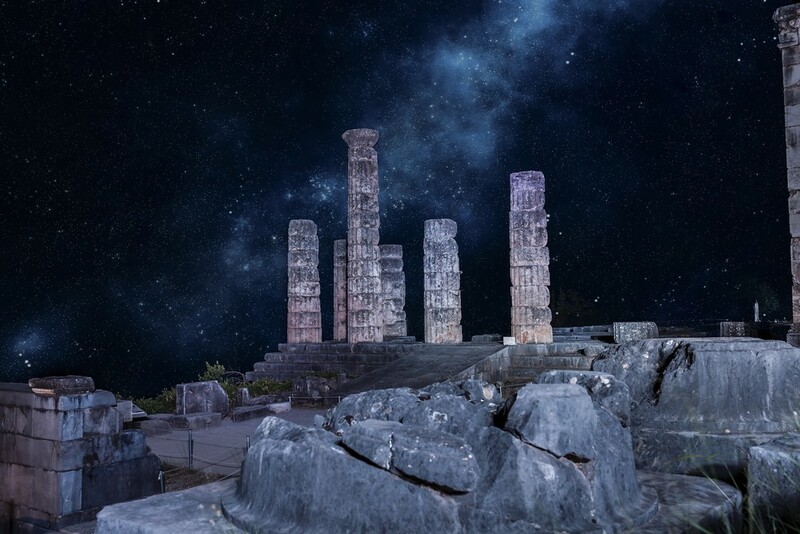 Continuing the climbing, we meet other Treasures foundations, bases of statues and all kinds of offerings that filled every inch of the Iera Odos. 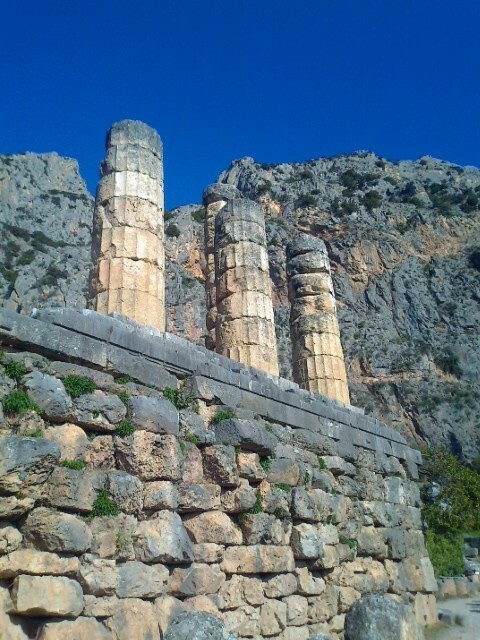 Shortly before the temple of Apollo, the magnificent building of Oracle, today’s visitors see a wall that seems to have been manufactured with great care. It’s a large polygonal retaining wall, whose purpose was the layout of the sanctuary. 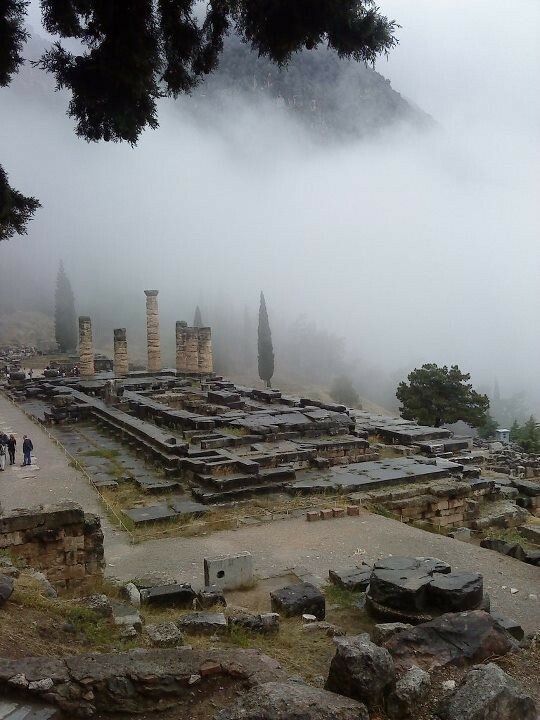 Just in front of it, we see today the ruins from the Loggia of Athenians, the space constructed by the Athenians under Pericles times to house war booty that they brought as offerings at Delphi. It’s a canopy, along which there is a pedestal for exposing the offerings. The marble pillars which are still preserved are made by Pentelic marble and the bases by Parian. 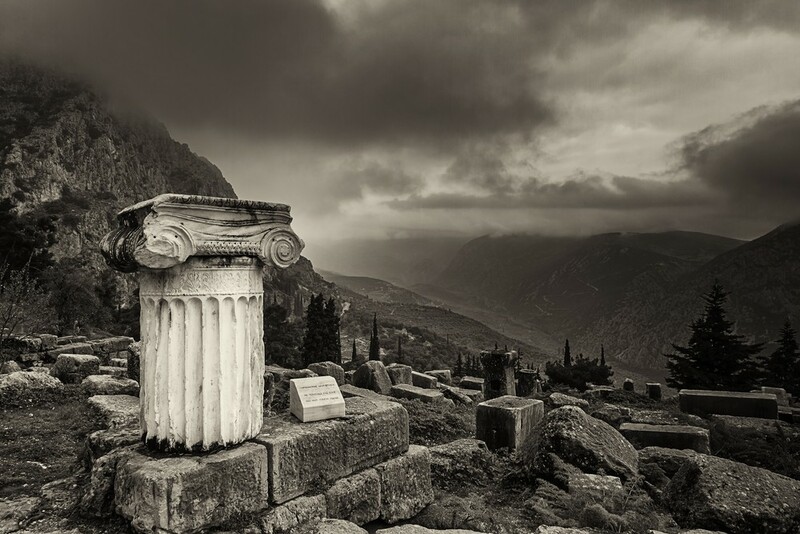 At the end of the ancient path is always dominated the temple of Apollo. 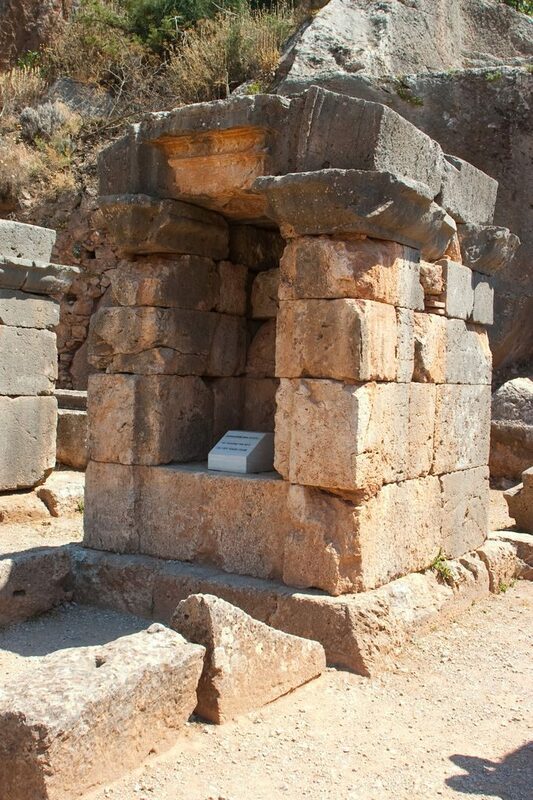 The evidence for its reconstruction mention an original limestone temple that was destroyed by the fire in 548 BC Pan-Hellenic fundraise, and the contributions of foreign rulers had contributed to the construction of the next temple, which was also limestone with a marble facade and sculptures by the sculptor Antenor. 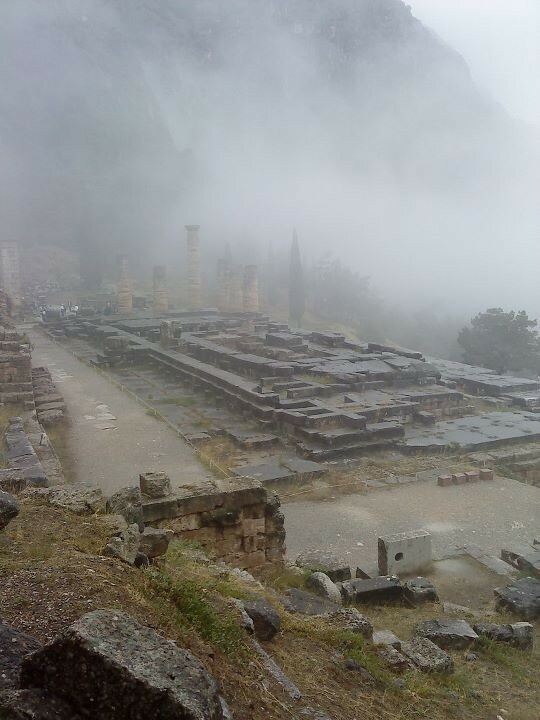 He destroyed the temple in 373 BC, this time by an earthquake. The priests of Apollo resorted again to a fundraiser to rebuild a new church. Meanwhile, the third holy war was inserted, so the third temple of antiquity was completed in 330 BC. 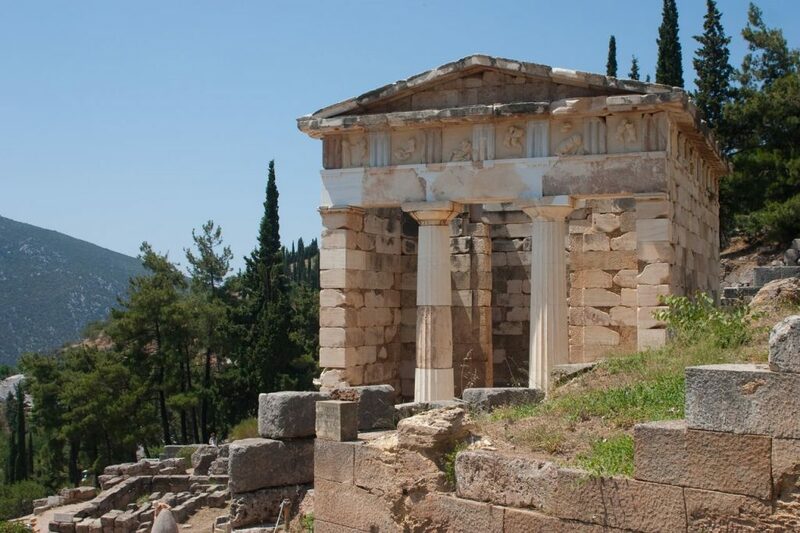 According to the evidence we have, it was built according to the plan of the damaged archaic: Doric pavilion with six columns on the short sides and 15 in long. We see today the ruins of this temple. At its deepest level, there was the sanctuary where the divination process unfolding was realized – from this segment there is not saved anything until today. 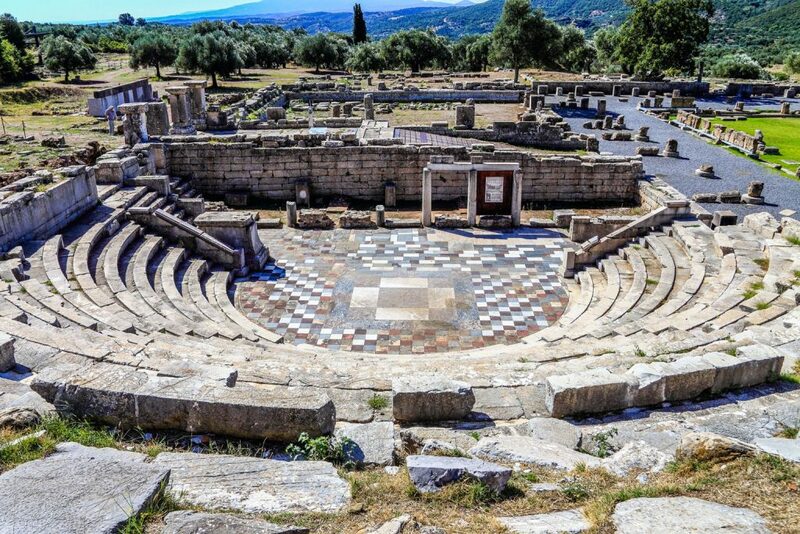 Further up the hill, after the temple of Apollo, there is the Theater and still above the stage, which were held in antiquity the Pythian Games. Both areas are preserved in excellent condition. 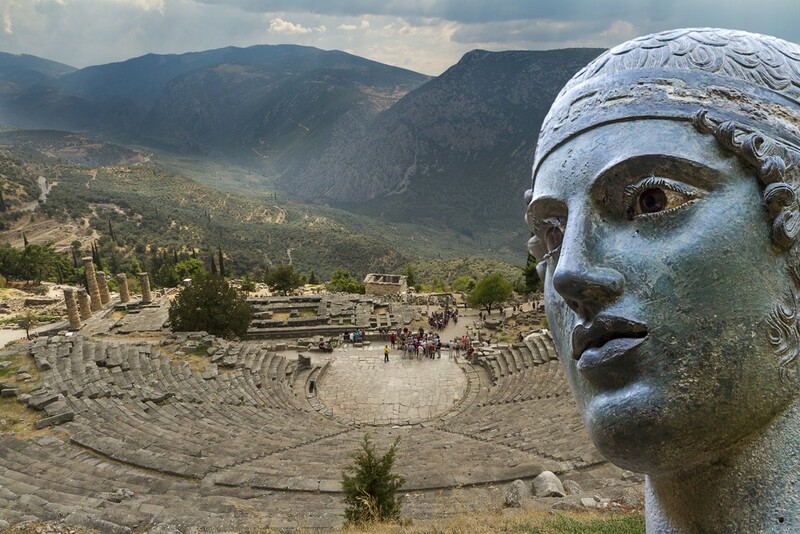 In the ancient theater of Delphi, the fights of voice and music were celebrated, under the Pythian Games. The auditorium of the theater was partly in the natural ground and partly in artificial additions. 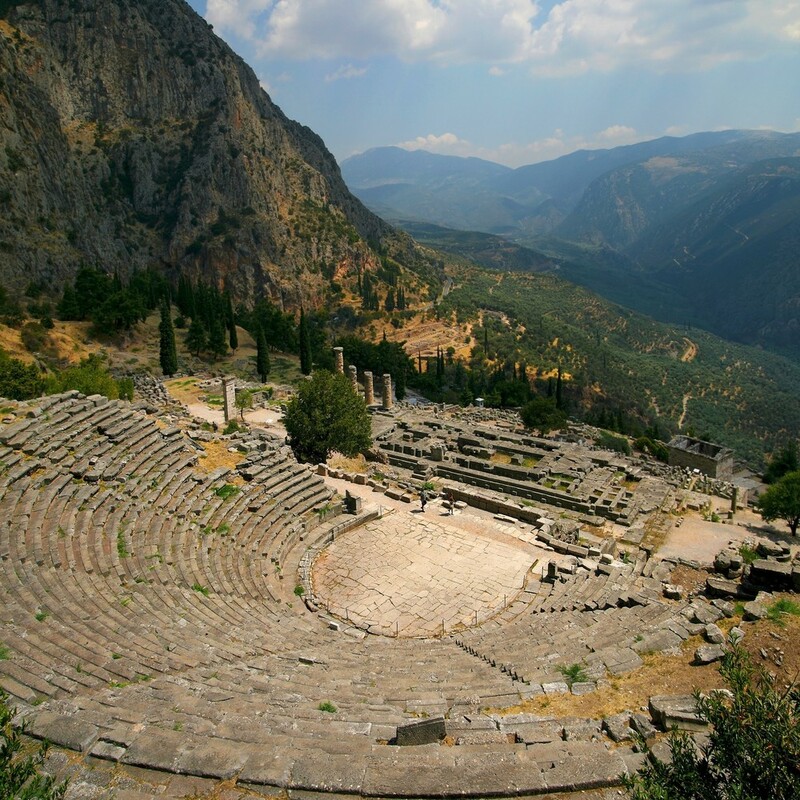 The style of theater that we see today is from the 1st century AD and its total capacity is of 5,000 spectators. 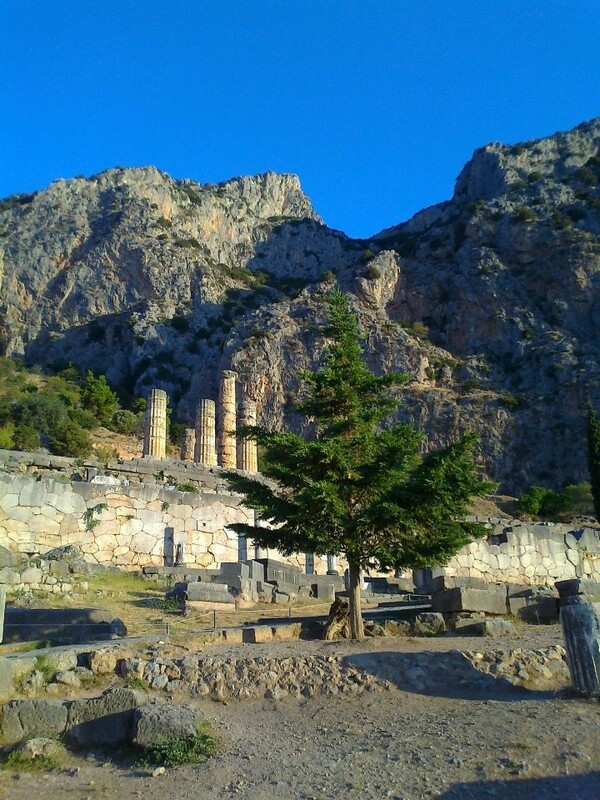 The Stadium of Delphi is located on the highest point of the hill, above the sanctuary of Apollo. Here leading the path that starts from the theater and the entrance to the site in ancient times was realized from arch, triumphal entry, the only one we know that in an ancient stadium. A platform with five steps was at the service of viewers, while the length of the track is equivalent to a Roman stage, i.e. 177.55 meters and a width of 25.50 m. The stadium has a hairpin with two rows of seats that had been united and interspersed by the scales which facilitated the viewers. It is estimated that this construction of the stage had a capacity of 5,000 spectators.